New Iranian Farsi IPTV BOX With 1600+ Live TV Channels & No Monthly Payments. Order our new International TV receivers to watch Free TV, Movies, In Sports Channels, Spanish Soccer, German Soccer, U.K. Soccer, Italian Soccer, French Soccer, U.S. Soccer, NFL, NBA, MLS, MLB, La Liga, Premier Soccer, Europe Soccer Leagues, Champion League, Live Shows, News & more. Save $1,000s on TV Programs & Services. Easy Wifi Connection & HDMI to TV Displays. No Dish & No Installation Required. Top AV Solutions for Residential & Commercial Since 1999! 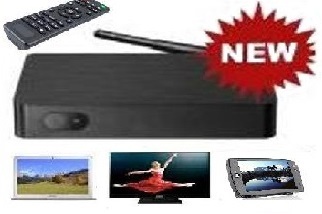 Easy to use & install internet TV streaming device at great price.